As a little girl, I was not a big fan of Easter. While I was perfectly fine with getting a basket of candy, I was utterly terrified of the Easter Bunny. I'm not really sure where that came from, but I'm thinking the bunny's crazy eyes and giant fangs might have played a small part. As the years went on, and I learned what Easter was really about, the holiday took on a whole new meaning. These days, after church, we generally have friends over after services to gather around our table for brunch. Of course, there is always a ham on that table! 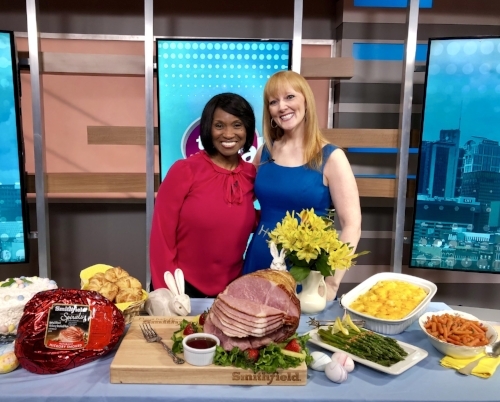 When they are already cooked and perfectly sliced, like the hams I showed for Smithfield this morning on CBS Nashville, it makes getting a meal on the table a breeze. This segment and post were sponsored by Smithfield. You can find a ton of great recipes and Easter meal planning ideas here. Happy Easter! There is a scene where Miss Hepburn's character, Bunny Watson, describes herself to Tracy's Richard Sumner as someone who "only drinks champagne when I am lucky enough to get it." This holiday season, I am lucky enough to work with Taittinger to feature their Champagnes on several TV shows. They are sponsoring these segments and this post, and have a Champagne to suit any taste, from the signature dry Brut La Francaise ($60 - and my favorite) to the sweeter Nocturne "City Lights" ($82). They even have a Prestige Rose ($84) for all of those rose lovers on your list. This year, Scott and I are hosting two Thanksgiving dinners. The first is actually next weekend, when a whole bunch of Sewell's are coming to New York. Then, on the holiday itself, we will host friends who have joined us for Thanksgiving dinner the last five or six years. I love cooking Thanksgiving dinner, so I am super-excited about getting to do two menus! Over the next two weeks, I'm sharing a few holiday prep ideas I'm chatting about on TV shows this month. Last week, I posted my mother-in-law's breakfast casserole recipe that is the staple of our family gatherings. Today, I am sharing a yummy recipe for Cornbread Stuffing with Ham - or, if you're from my neck of the woods, Cornbread Dressing. I shared this recipe for Smithfield on a TV segment this week in Nashville. Whatever you call it, it's savory, yummy, and has that perfect crispy crunchy top. The only thing I'd add to this recipe? A note to make an extra pan if you're hosting a crowd. After all, it's not Thanksgiving unless you have leftovers, and stuffing/dressing is at the top of my list to enjoy the next day. What are your favorite Thanksgiving leftovers? After Christmas last year, while we were driving to Nashville to catch a flight back to New York, I commented to Scott that we had been in Tennessee so long, I was starting to think of biscuits as a vegetable. That is because when the Sewell's get together, breakfast is definitely the main meal of the day! Each morning, we all gather around the table about 9 or 9:30. After we eat, we stay around that table, talking and laughing until well after noon. That conversation is only interrupted by kids going outside to play, or someone periodically heading back to the kitchen to pour another cup of coffee. The standard menu consists of "breakfast casserole," sliced fruits, biscuits, and coffee. And it is perfect. Breakfast casserole is a gooey, bubbly pan of sausage, eggs, and Velveeta - with crispy bread crumbs or croutons on top. Basically, all of your major food groups. With 14 people in the family, including four hungry nephews, my lovely mother-in-law seems to magically pull pan after pan of these casseroles out of the oven like clowns piling out of a clown car. Because of these memorable breakfasts, I was super-excited to partner with Smithfield this holiday season to showcase their fresh breakfast sausages and spiral-sliced hams. Enjoy them on their own, or cook them into a recipe like this cornbread stuffing with ham, or Laurel Sewell's breakfast sausage casserole! 1 cup Velveeta cheese, grated (bonus culinary points if you, like my mother-in-law, can actually grate Velveeta. I have to cut it into chunks). Melt two tablespoons butter over low heat. Blend in flour and cook for one minute, stirring constantly. Gradually add milk. Cook over medium heat, stirring constantly. Add salt, pepper, and cheese, stirring until smooth. Set cheese sauce aside. Cook sausage and drain well. Set aside. Scramble eggs over low heat until softly set. Combine cheese sauce, cooked eggs, and cooked sausage, and place in greased 9 x 13 baking dish. Combine melted butter and bread crumbs. Top casserole with crumb mixture and sprinkle with paprika. Bake uncovered for 25 minutes. Of course, leftover ham or sausage from any meal also tastes great on a biscuit. What are your favorite holiday meal traditions? So you want to be a dog walker? Good luck with that. TV girlfriends - if you're looking for a light, fun read, pick up CNN anchor Alisyn Camerota's book Amanda Wakes Up, which was my airplane reading during last week's TV tour. I am nowhere close to being a millennial, but I haven't a clue about using power tools or taking care of a yard, either. But I do know how to cook (and love doing so!) - and know how to clean our home and do laundry and other basic life skills. Interesting look at what retailers are calling the "do it for me" generation. Such a fun birthday present for me this year! Don't think I have mentioned this yet on the blog, but as an Anglophile, royal babies make me so happy. And guarantee I'll buy virtually any magazine that has this little branch of the Royal Family on the cover. As someone who frequently works with food stylists, this new culinary school emphasis on photography and social media skills totally makes sense.